How many times have you grabbed a TV remote control, and then become confused over which button you needed to push? You just want to turn down the volume or change the channel, but there are so many options that you can’t find the right button. Perhaps you even grabbed the wrong remote, and now sound is blasting from the stereo! You become frustrated and turn everything off, or even leave the room to do something else. When most people pick up a remote control, they almost always want to do one of three things: Change the channel, turn the volume up or down, or power off the device. 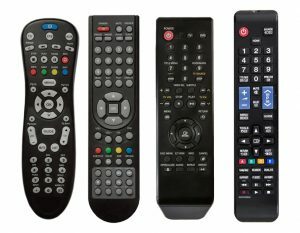 And yet, remote control designers add all of these extra buttons and mix up everything so that you’re left with a confusing mess. It shouldn’t be so difficult to perform one simple, everyday function! If you can relate to this scenario, then you understand the feeling of being overwhelmed by too much technology. It’s a common problem today; most of the time, we want to accomplish a simple task, but sorting through a huge array of options causes us to feel overwhelmed and give up. Believe it or not, that’s how your website visitors might feel. Many website designers today are pulling out all the stops, adding every bell and whistle under the sun to business web pages. The common line of thinking is that “more is better”, but what really happens is that web visitors are bombarded with too much stimuli. With tabs, drop-down menus, and links galore, the average user can’t even find the information they were seeking. Before long, visitors give up and leave the website. You didn’t help them out with the information they wanted, and most likely, they didn’t follow your call to action. They’re disappointed with your website, and your lead capture numbers haven’t grown. Much like you wish for a simple, user-friendly remote control, the average website viewer hopes for the equivalent in your web page. They come to your website looking for information, and a streamlined design will help them find it. And of course, as a token of their appreciation, many will follow your call to action, and you will gain a new lead. This is why we focus on the end user’s needs, not overstimulating, flashy gimmicks. The purpose of a website is to share the information that your visitors seek, in a simple and straightforward manner. When your visitors are happy, so are you. And that’s what we want to see: Happy web visitors, happy customers, and happy business owners. For more information on building a user-friendly website, give us a call. We can help you decide which elements are important to include in your design, and create straightforward marketing content that your visitors will appreciate.